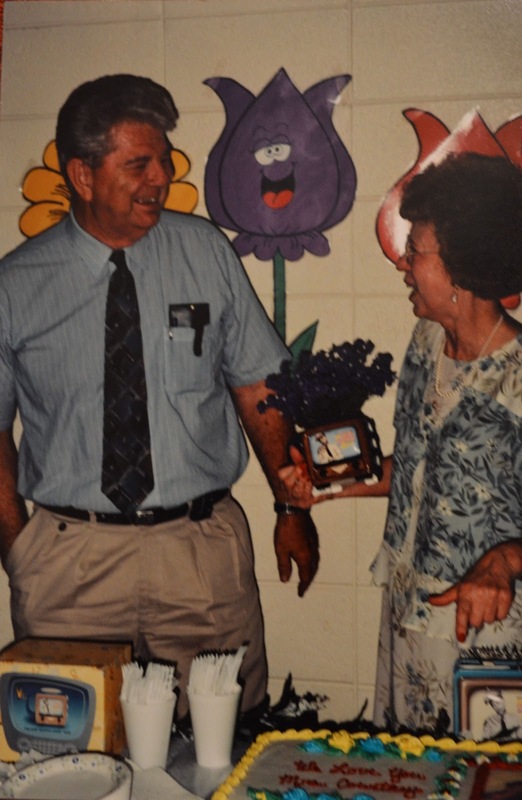 Mom and Dad, at Mom’s farewell party at Jessieville Elementary School. Photo courtesy of her friend and colleague, Mrs. Cheryl Kastner. She’s sort of like a doctor, only for learning disabilities. She worked hard for many years helping hundreds of students who struggle. She makes learning fun. She knows how to teach the mind and touch the heart- a rare combination. I suppose that’s why her success rate is so high. In the end, she knows it’s not about the grade average or the test score, it’s about the student’s feeling of success. Are they smiling more? Do they laugh? Is there a sparkle in their eye that wasn’t there when they first walked into her classroom? Have they gone from “I can’t” to “Maybe I can!”? If the answer to any of these questions is yes, then she has succeeded. Who is this miracle worker? She is someone I know quite well, she is my mother. I’ve seen it happen over and over. Parents would walk into Mother’s classroom on a summer afternoon while we are setting up, decorating bulletin boards. Sometimes they have their child with them, sometimes not. They see me standing on a chair, stapling wavy, corrugated border onto a cork bulletin board and instantly feel as though they have interrupted. What they need to say is private. Mother steps out into the hall. I see her shadow as she is talking quietly, and listening intently, to this concerned mother. Her child is struggling, and not only do they struggle with learning – a monumental trial for any child – but they also deal with the insults from their peers. After only a few minutes of conversation with Mrs. Courtney, however, that mother feels the burden lifted. She has hope, because her child has hope – a mother’s greatest desire. She knows that her child has a friend, an ally, a partner, in a little red-headed teacher some call “Mrs. C”. The school year begins, and this wonder woman has an enormous task ahead of her: helping a group of students beat the odds, which are not in their favor. She writes the IEP’s (Individual Education Plans) for each child, and begins executing those plans. She has some discipline problems, but nothing she can’t handle. There are peaks and valleys, wins and loses. But through it all, Mrs. C keeps her smile, her energy, and her cheers for the student who is ready to give up. She loves the underdog; she loves to see the one who is discounted, count. And each one leaves her classroom knowing that they mattered to her. Not one parent ever asked my mother how she voted. They never questioned her as to whether she was a racist or asked her religion. They judged her character by her actions, and therefore knew she was a good person and a great teacher. That’s the real world. It isn’t what we see in the headlines or on the morning news shows. It’s the people we know in the life we’re living now. We all make a difference when we give of ourselves to the world in which we live. We offer our skills, our love, and our time to a real person, and hopefully, we make them better for having known us. That’s what my mom did. And that’s what I want to do, too. I met your mother just a couple wks ago, at Bro. Graham’s daughter’s wedding. She is such a soft spoken, dignified lady! I can see why you hold her in such high regard. A true gem, indeed. I’m so glad you got to meet her! Now I think it’s my turn to meet you! 🙂 Thank you for the kind words. Hope you and your family are doing well. Oh, wow, Valerie, I am crying and very humbled by what you wrote. Thank you for a tribute that is far more wonderful than I deserve. It is, however, an inspiration to keep trying! Thank you so much. Love you, Mom! I am thankful I have had you in my corner all these years.